Similar to the way that a well diversified investment portfolio helps shareholders, it can pay off to diversify your fundraising revenue streams. If you rely heavily on one strategy, such as a large annual event, your organization’s overall success and growth becomes dependent on that single event and its outcome. Therefore, your mission and the people, places, and things you impact also rely on that one major event as well. Though you may do all that you can to plan for a big fundraiser, you can’t guarantee everything will go smoothly. What if a horrible storm prevents attendees from making it to your annual gala? Recently, the Academy of Music was forced to cancel their annual fundraising ball due to a state of emergency in Philadelphia. Their primary source of income was lost for the year due to something entirely out of their staff’s control. The success of your organization and its programs should not be left up to chance. While we can’t always eliminate risk, we can mitigate it. This is where your expanded fundraising portfolio steps in. By investing in different areas, a downturn in one wouldn’t likely impact other components in your portfolio. Instead of breaking all the eggs in your basket, you’ve just dropped one. If you’re currently using a limited number of strategies, you’re missing an opportunity to employ other methods that can help expand your audience, increase revenue, and protect the health of your organization in the event of a downturn. Use the following suggestions to supplement traditional events, grant writing, and your standalone donation form. Each section includes helpful tips for getting started. When you ask event participants or donors to become fundraisers for your cause, you can raise exponentially more money. Instead of bringing in revenue from just entrance fees, you can raise more funds because participants ask their own friends and family for donations. The average fundraiser raises $450 from six donors. * With the right fundraising platform, you can easily create fundraising pages that yield beautiful results that are branded to your organization. Use the fundraise for entry model for your next event (participants must raise a certain amount to enter the event). Give event attendees an option to fundraise on top of their registration fee. Host an individual or team fundraising competition during your next campaign. Provide a year-round fundraising option on your website. Set realistic goals for your peer-to-peer campaign by calculating the number of people you can get to create fundraising pages, how many of them you expect to actually raise money, and how much you expect each to raise. Prepare resources that educate and equip fundraisers to be successful (fundraising tips sheet, sample emails, and design resources for their personal fundraising pages). 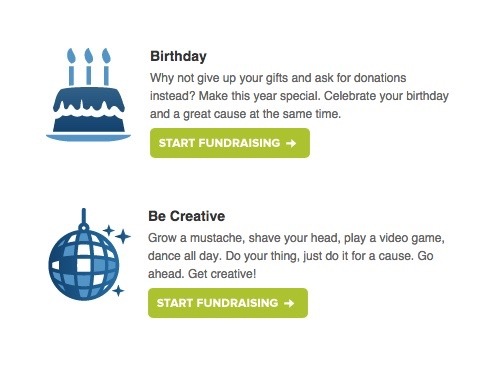 Encourage supporters to raise money throughout the year by providing them with creative fundraising ideas. Ready to get started? We’ve compiled resources and tools to help you launch. Certain events, such as 5Ks, are a great way to raise both awareness and support for your cause while hosting a fun community activity. Unfortunately, physical events present certain limitations. You may have avid supporters on the other side of the country who wish they could attend. Open the doors of your event to anyone who wants to participate—regardless of their location—by adding a virtual component to your campaign. 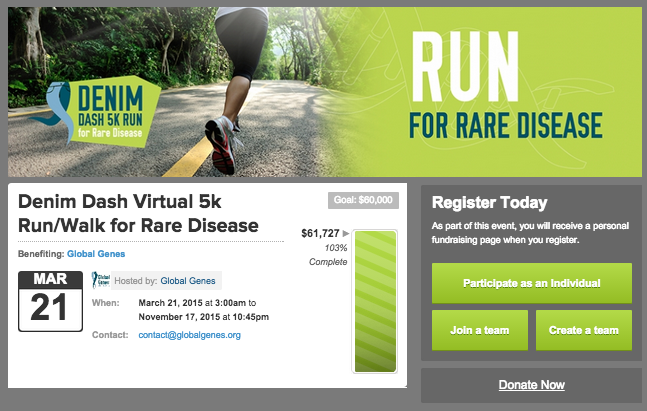 Virtual 5Ks can help you make the most of a physical event. Global Genes, for instance, asked participants to run or walk between March 21 and 29. Participants paid a $35 registration fee and were then asked to start a peer-to-peer fundraising page. When they registered, they received a race bib, T-shirt, and ribbon in the mail so they could gear up and run in honor of the cause within the set dates, no matter where they were. As indicated in the image below, the fundraising page was still live past March 29 and continued to collect donations. But there’s no need to stop at a virtual component for your 5K. Host a webinar to expand the reach of a speaking event or open house. Run a virtual tournament in congruence with your gaming or sporting event to make the most of your diligent event-planning. 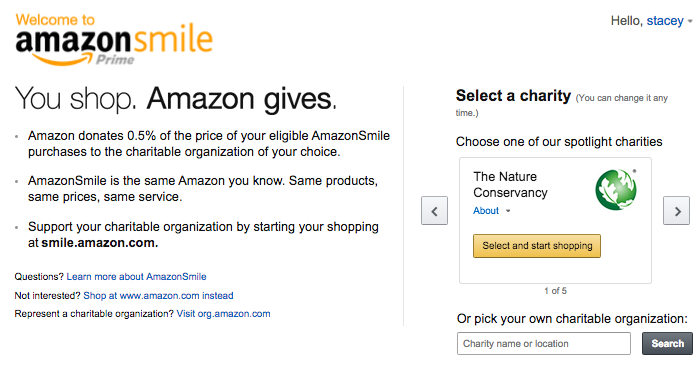 Promote this virtual option and its guidelines through your website, social media, and emails. Brainstorm fun ways to help online participants feel like a part of the actual event. Send them event gear or images they can use on their social pages. For example, National Novel Writing Month gives their challenge winners assets like the image below. While monthly giving offers huge benefits for your organization (a consistent and sustainable revenue stream, for starters), it also provides your recurring givers with several benefits. When a donor joins your monthly giving program they sign up for automatic charges to be made to their accounts, eliminating the hassle of having to fill out a donation form several times a year. A small monthly gift also gives supporters a more manageable giving option compared to a large one-off donation. A $120 donation becomes 12 payments of $10. Your organization should also promote any special perks that monthly donors would receive as members of a distinct community. Pencils of Promise outlines the exclusive benefits of their recurring giving program on their website to attract donors. Identify the target audience for your recurring giving campaign. Ideal candidates can include large donors and those who’ve given more than once over the course of the year. 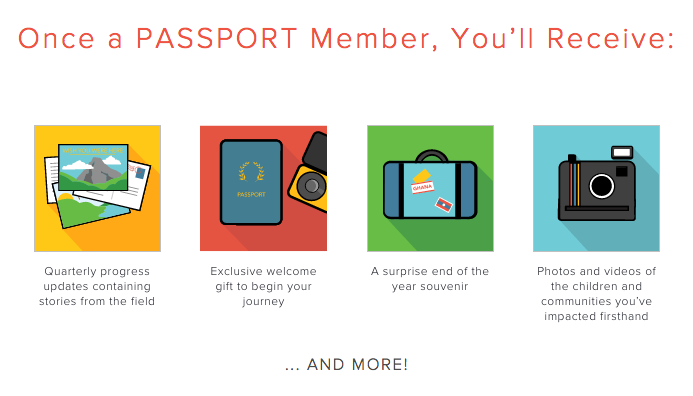 Define the “perks” you might offer monthly givers in exchange for their support (swag, regular progress updates, or photos and stories of the people you serve). Ready to discover the nitty-gritty details behind what it takes to run a successful recurring giving campaign? Why not leverage existing donations to bring in even more? Squeeze every last drop out of major gifts by creating a matching gift campaign. This particular fundraising strategy uses a large gift to motivate donors to help raise a certain amount of funds within a certain timeframe. Matching campaigns hold incredible potential when coupled with your recurring giving program. Suddenly, a $40,000 gift turns into a considerable amount of new recurring revenue for your organization. When you meet prospective donors to secure a major gift, let them know how you plan to turn their gift into an even more powerful contribution. Guest blogger Matt Scott recommends pooling together gifts from several donors if you don’t have one donation large enough to use for a matching campaign. Establish a timeframe for your matching campaign and determine a strategy for engaging your community throughout its timeline to create a sense of urgency. When you cohost events with other organizations, both of you can benefit financially. Consider teaming up with a partner to save on costs and increase the value of your event. An existing partnership can also open your organization to new opportunities, such as exposing you to a new audience. Define the guidelines of the partnership, who is responsible for what, and how the proceeds will be distributed to ensure both of you are on the same page. To find an organization to join forces with, look to your network for like-minded groups. It can also make sense to collaborate with an organization outside of your cause sector or area of expertise if they maintain similar values. Despite having a different focus, you can learn best practices from successful organizations that can be applicable no matter what your cause. Conduct research to find possible partners or sponsors who align with your organizational values. Create a value proposition that explains why a partnership would be mutually beneficial—including how it will help drive both of your core missions forward. An integrated approach helps you cater to a larger spectrum of different demographics. Boost the overall effectiveness and reach of your traditional fundraising methods, such as direct mail, by integrating them with your online strategy. By connecting the look and feel of these two worlds and using your offline world to direct traffic to your online world, you will offer demographics who prefer the opportunity to engage with you online the means to connect with you in a seamless fashion. Keep the online world in mind when you create your direct mail campaigns, so you can link the two communities and drive website traffic and donations. Include ways for your offline community to connect with you online. Ask for follows, likes, and online donations. If your donation pages are not mobile-responsive, you’re most likely missing out on a considerable stream of revenue. Donation pages that fail to format across devices frustrate donors on the go. Cater to these individuals with a branded, mobile-responsive donation page. On average, donations made to branded mobile responsive pages are found to be 155 percent larger than gifts made through third party applications. Make sure your fundraising software uses responsive design so that campaign pages adapt to any screen size. Deliver responsive emails that link to your donation page (check out free templates, such as MailChimp’s, to get started). This is a quick and easy way to funnel a percentage of your supporters’ year-round online shopping proceeds to your organization. Not much to lose here! A new report by the Consumer Intelligence Research Partners found that Amazon Prime members spend an average of $1,500 per year. That’s up to an average of $7.50 a year that you can make from every Amazon Prime member of your community who selects your organization. By diversifying your organization’s fundraising portfolio, you guard it from the things you can’t control. Determine which methods are best aligned with your development goals and then build a new stream of revenue. Not only can you raise more funds when you execute these strategies well, but you can also create an opportunity for new donors to get involved and become champions for your cause. Is Your Online Fundraising Strategy Diversified?